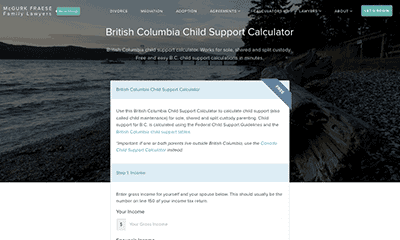 The BC child support calculator can be used to assess the basic amounts that may need to be paid by a paying parent when it comes to child support amounts. Enter the gross amount of income the paying parent would make, following which you can enter the number of children involved via the drop-down menu in the next space. 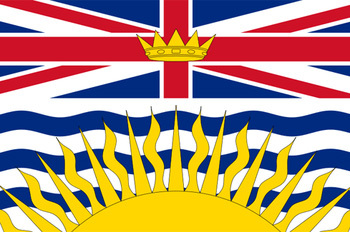 The BC child support calculator will then provide an amount of child support potentially payable by the paying parent. This child support calculator is for straightforward sole custody situations. For shared custody, try this British Columbia child support calculator instead. The courts of British Columbia have specific rules set out for how one can apply for child support based on relationship status of the parents. If you are the person applying for the child support, you should consult courts administration at the Supreme Court of British Columbia or the British Columbia Provincial Court, Family Division for further information. It is important that you know what, where and how you go about applying for child support and that it is through the right level of court. If the amount of child support to be paid is too high, then the paying parent must prove that there is a financial hardship preventing them from paying that amount. The amount calculated by the BC Child support calculator may not be the amount the paying parent can afford to pay. Any circumstantial evidence of hardship would have to be reviewed by the court and ruled on whether it is in fact hardship on the paying parent. The BC child support calculator is on this website for informative purposes only. It is not meant to substitute qualified legal advice of a lawyer. For further information on BC child support and any BC family law matters, you should contact a lawyer. If you think you cannot afford a lawyer, contact your local BC legal aid office for assistance and direction. Another child support calculator, but this one also does spousal support and calculations for shared custody situations. 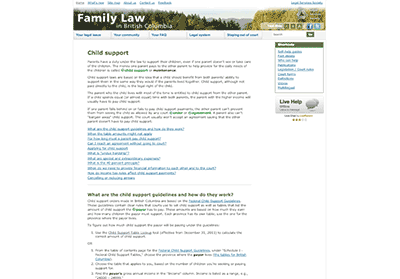 The LSS of British Columbia has created this fact sheet on child support to answer many commmon questions. 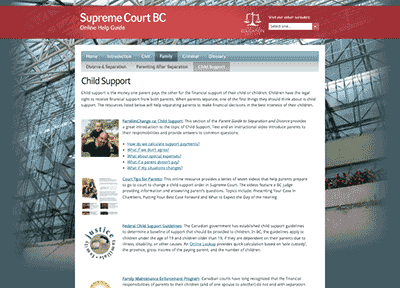 The Supreme Court of British Columbia offers a guide to child support law in the province. Advanced child support calculator with shared custody calculations and spousal support. The Government of Canada child support table amount look-up tool. A spousal support calculator based on the Federal Spousal Support Guidelines.